Action Alliance MURDER MYSTERY Dinner - December 22! With the Christmas season well on its way, everyone at the North Pole is working hard to make this a holiday to remember. Despite the efforts of the arctic inhabitants, productivity is at an all-time low, upsetting many and putting Santa’s legacy at stake. Desperate for a change, there are many who are willing to do almost anything to increase efficiency and restore peace at the North Pole. But only one who will go too far and commit an act of murder in this mystical place. Includes: Sit down dinner (prepared by Chef Susan Ackley), Drinks (soda, water, beer, wine), and a raucous and mysterious night of holiday cheer! Please "SHARE" this link with anyone you know that LOVES a good Murder Mystery Dinner, to have FUN and/or that wants to help these good causes!! Where to Celebrate New Years Eve in Costa Rica!!! Live Music (Jazz & Bossinova) and Dinner - a more tranquilo evening. Appetizers - PortoBello Mushroom Tart - OR - Lobster Bisque. Main Course - SeaBass with Cauliflower Sauce - OR - Grilled Shrimp on Papaya Sauce - OR - Filet Mignon with Shitaki Mushrooms. Dessert - Ice Cream. 1 glass of wine. Disfruta nuestro ambiente con Música en Vivo, Serenata con Mariachi y Carnaval con Comparsa. 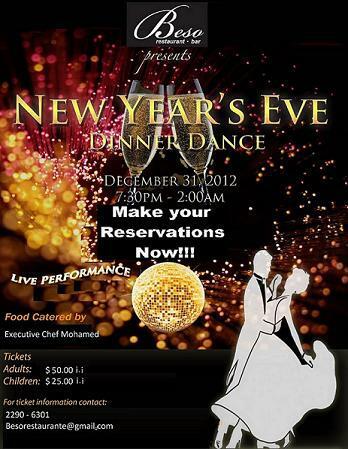 Champagne, Appetizers, Salads, Main Course and Dessert! COST: The screening is FREE and the bags of special props will be 2500 colones. NOTE that SPACE IS LIMITED so get there early!!! 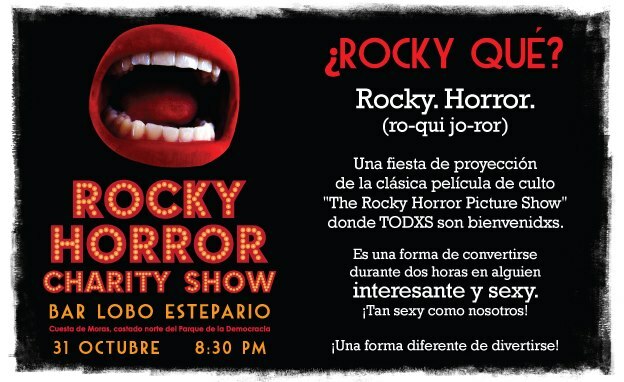 Once again, the Lobo Estepario Bar in San José will host a very special presentation of the film in it's full audience participation version. The WILDLY FUN CAMPY cult film “The Rocky Horror Picture Show” (1975), was directed by Jim Sharman and starring Tim Curry, Barry Bostwick, Susan Sarandon and Meatloaf. 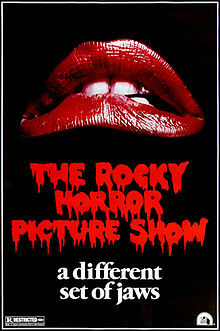 For 37 years, “The Rocky Horror Picture Show” (FYI - it is NOT a “horror film”. It is a “campy” rock-musical•parody of old B-Movie, Science Ficture and Horror Films of the late 1940s through early 1970s) has been the first and only true audience partici-(SAY IT! )-pation movie. People yell back lines at the screen during the extended pauses between dialogue, dress up in costume and act out the film like they were in it - doing things like when it was raining - spraying spray bottles/water guns in the audience, or in the wedding scene - throwing rice or “toast” when they made a toast, laugh, dancing, warning characters before something was going to happen, singing along and shout insults to the screen mid-film. Some people dress up in costume/drag (hence the popularity of it on Halloween). In the states this movie has a campy “cult following” and is usually held at a midnight showing! People came back over and over and over again!!! NOTE: Audience participation is NOT “mandatory” (though it SOOOO adds to the MEGA FUN!! factor here!!!). Organizer Hector Gomez Hertz, said that TMC is showing it in October! All proceeds raised from the screening will go to the Nephrology Foundation / Fundacion de Nefrologia (facebook.com/FundacionDeNefrologia) for kidney/dialysis patients at Hospital San Juan de Dios. They'll also have some special surprises and raffles for those who attend! I hear that Bar Lobo Estepario is a funky bar that caters to the more artsy/avante garde crowd which means they serve cheap drinks (Cervezas - 1,100, Johnny Walker Red - 1,500, JW Black 2,200) and their food Menu has 48 items to choose from ranging from just 2,000-4,000-c and INCLUDES all taxes/tips - so come hungry/thirsty!!! THIS sounds like THE EVENT in CR to celebrate Halloween!! It is TRULY an EXPERIENCE!!!! I'm SERIOUSLY considering going!! You might want to prepare a bit before you go - either to be reminded of what to bring or learn just the heck this movie is about!!! WHAT DO YOU BRING TO A SHOWING OF ROCKY HORROR PICTURE SHOW? 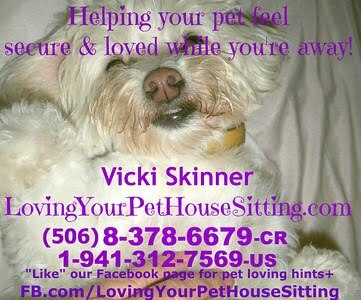 PLEASE "SHARE" this link with ALL your FUN ADVENTUROUS friends!!! WARNING - SASY Animal Licensing Scam!!!! Has anyone called you saying they're representing SASY saying they can come to you and license your dogs that are in your home for 8,000-colones??? BEWARE!!!!! This is a scam!!!!! (or are they possibly casing the joint???)!!!!!!!!!!!! Demostremos nuestra fuerza. (Favor presentarse de 5:30pm en adelante, la vigilia que será en el Bulevar de la Asamblea durará hasta las 8:30pm. El ingreso a la Asamblea será de 5:30-6:30pm para las personas que quieren participar en la presentación del proyecto. 5:30pm onwards, the vigil will be on the Boulevard of the Assembly last until 8:30pm. Admission to the Assembly will be from 5:30-6:30 pm for those who want to participate in the presentation the project. Una vez más llegamos donde todos ustedes para pedir su valioso apoyo respaldando el proyecto reforma de ley para penalizar el maltrato y la crueldad animal. Tenemos el gusto de comunicarles que el Proyecto de Iniciativa Popular contra el Maltrato Animal fue aprobado por el Tribunal Supremo de Elecciones y la resolución se le notificó a la Asamblea Legislativa el pasado viernes 12 de octubre del 2012. 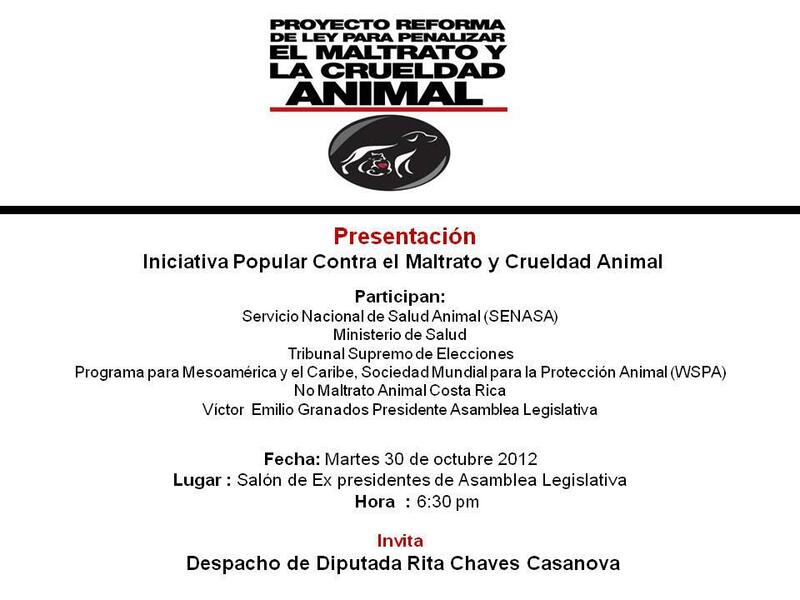 Por eso los invitamos a una Gran Vigilia contra el Maltrato Animal en el Bulevar de La Asamblea Legislativael martes 30 de octubre, para manifestarnos como pueblo haciéndonos presentes en la Asamblea Legislativa antes de que termine el Mes de los Animales, para recordarles a los diputad@s que ya cumplimos un año de haber presentado el Proyecto de Iniciativa Legislativa y que este año honramos nuestro compromiso presentando el Proyecto de Iniciativa Popular aprobado, con más de 188000 firmas de apoyo, tal cual nos lo solicitaron. El gran momento llegó y ocupamos de todos. Requerimos la asistencia de cada asociación o grupo de rescate o bienestar animal que esté apoyando la reforma de ley 7451 de Bienestar Animal y les pedimos que al menos 2 representantes de cada organización nos acompañen en ese día tan importante para la democracia participativa de nuestro país. También estamos convocando a los rescatistas independientes y a los amantes de los animales que de una u otra forma están cansados de tanto maltrato y firmaron por un cambio para que se haga justicia a nuestros animales. Vivan la emocionante experiencia al final de nuestro largo y duro camino de más de 4 años de luchas, marchas y colectas de firmas, para cerrar con la ipresentación de la niciativa popular que ahora iniciará su etapa legislativa, con el peso y prioridad que demanda un proyecto de voluntad popular, lucha que ustedes pelearon y apoyaron a nuestro lado. Demostremos a cada diputad@ que somos ese pueblo que fue a firmar para decirle No Al Maltrato Animal y que somos los cuidadanos ejerciendo su derecho constitucional de legislar, convertidos en el diputado número 58, que quieren una ley efectiva para Costa Rica. Por eso vamos todos este martes con nuestras mascotas, pancartas y velas o faroles, de forma pacífica y respetuosa, a dar apoyo a la Presentación de la Iniciativa Popular y demostrar que los que firmamos contra el maltrato estamos presentes respaldando nuestro proyecto. Again we ask where you all for your valuable support by supporting the law reform project to penalize abuse and animal cruelty. We are pleased to report that the People's Initiative Project against animal abuse was approved by the Supreme Electoral Tribunal and the decision was notified to the Legislative Assembly on Friday 12 October 2012. So welcome to the Great Vigil against animal abuse in the Boulevard Legislativael Assembly Tuesday, October 30, to show us as a people making present in the Legislative Assembly before the end of the Month of Animals, to remind diputad @ s already fulfilled one year of filing the Draft Legislative Initiative and this year we honor our commitment to presenting the Popular Initiative Project approved, with over 188,000 signatures of support, as they requested us. The big moment came and take care of all. Require the attendance of each association or rescue group or animal welfare reform is supporting Animal Welfare Act 7451 and asked them to at least two representatives from each organization to join us in this important day for participatory democracy in our country. We are also calling for independent rescuers and animal lovers of one form or another are tired of so much abuse and signed by a change for justice for our animals. Live the exciting experience at the end of our long, hard road for more than 4 years of struggles, marches and signature collections, to close with the NITIATIVE ipresentación popular now begin its legislative stage, with the weight and priority demands project of popular will fight you fought and supported us. Let's show each diputad @ we are the people that went to sign to say no to animal abuse and we are The citizens exercising their constitutional right to legislate, converted in the 58th deputy, who want an effective law to Costa Rica. 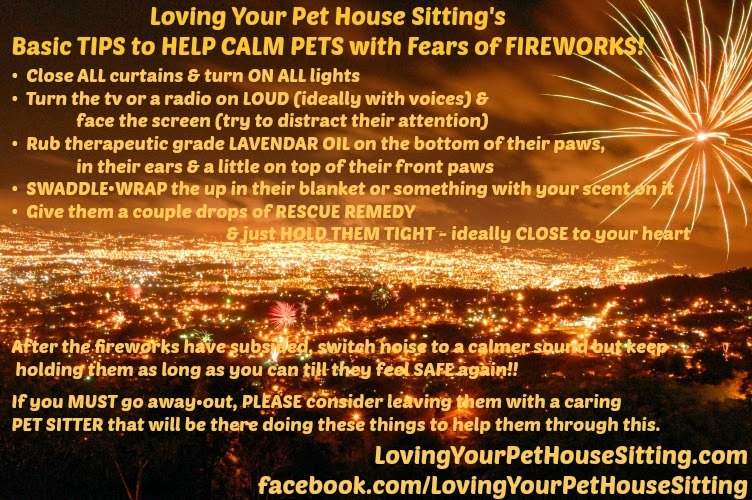 So we all Tuesday with our pets, banners and candles or lanterns, peacefully and respectfully, to support the presentation of the popular initiative and show that the undersigned from abuse are present to support our project. Los esperamos amigos, no le fallen a los animales. The hope friends, do not fail to animals. Let's show our strength. Born in Germany and raised in urban Chicago, Illinois, Henry Karczynski studied business (MBA) and worked in commerce for several years before finding his true vocation in life. He has been continuously involved in agricultural development since joining the Peace Corps as a volunteer in Jamaica in 1975. Henry has resided in Costa Rica since 1977 and has been manager/owner of Villa Vanilla, the farm home of www.rainforestspices.com since 1987. Never a proponent of conventional chemical agriculture the farm has been certified organic since 1992 and biodynamic since 2000. ­­The farm produces a variety of quality spices, including vanilla, that are sold literally around the world. Henry's studies of ancient agricultural practices peeked his interest in archeology and human origins. His holistic interests have opened a door about human potential and spirituality. Seating is limited to 25 people. Popcorn and drinks will be served. BRING YOUR OWN FOOD SNACK TO SHARE. LOCATION: Escazu (Bello Horizonte) - at Karen and Sam Butlers home. Directions given upon reserving your space! Please "SHARE" this link with people you know that will enjoy this event! My buddy (and the BEST realtor I've found in Costa Rica [specializing in the Escazu area]) Daniel - has created the most comprehensive list to almost every restaurant in the area South/West Central Valley area - from Escazu, Santa Ana, Ciudad Colon, with some in Sabana, Rohrmoser, Paseo Colon and San Antonio de Belen. His Information blog is FILLED with all sorts valuable information so sign up for it - especially if you live in or are interested in these areas! but I haven't had time to updated in ages though MUCH of the info is still gives you an overall good base (like directions, hours, description of types of food+++). (to add to these lists AND invite to the opening!)? Something on the list closing? Changes? If you Invite me as your guest to your restaurant, I'll write it up on the blog and share it with over 1,500 people on my Facebook (but warning - I WILL be honest!!!). PLUS I will share a list of places (mainly Message Boards/Forums) where you can share your restaurants info! Contact me about hiring me for Restaurant and Bar Marketing and Promotions Consulting! PLEASE "SHARE" this information with EVERYONE you know that likes to eat out in Costa Rica!! Barry with ElPuente-TheBridge.org shared this PERFECT short video made by two Costa Rican filmmakers about dealing with the Bureaucracy one often goes through in Costa Rica!! Be prepared like this gal and your life will be SOOOO DIFFERENT!!!! SHARE this with EVERYONE you know that's been here - done that - or is thinking of moving or doing business in Costa Rica!! HELP THEM make their lives easier!! Could part of it POSSIBLY be because of THIS type of action??? October 25th, 2012 – On July 31st, 2011, a man by the last names Zamora Valerio was caught with one TON of “High Red” marijuana. Zamora, from Nicaragua, was arrested in an operation that had been coordinated with United States coastguard and Costa Rica’s Drug Control Police (PCD, in Spanish). The man was arrested along with 5 others, four of whom are in preventive detention. However, a judge allowed Zamora to be freed by posting $6,000 bail, which he quickly paid, and then fled the country . . . Authorities say the man is presumed to have fled to Haiti." Do YOU know of any PARTIES • CLUBS or HOTELS catering to the SWINGERS Lifestyle community (including by invitation private parties) in Costa Rica? How about any places where NUDIST are welcome to be free (even though it's "illegal" in Costa Rica - even in a PRIVATE hotel!!)?? I'm seeking names, cities/directions/locations, hours - anything you can share. The majority of states require voted ballots to reach local election officials by the close of polls on Tuesday, November 6. U.S. citizens who want to participate in the 2012 U.S. elections should already have returned their absentee ballots to their local election officials. U.S. embassies and consulates are not polling places; same-day in-person voting is not available outside the United States. Ballot not yet sent to local election officials? All voters who wish to participate in this election who have not yet sent their ballots to their local election officials should consider returning their ballot to the United States via an express courier service such as FedEx, UPS, or DHL. Some states or counties may allow you to return your voted ballot electronically. Check your state’s voting procedures at FVAP.gov for guidance. Check your state’s voting procedures at FVAP.gov for guidance. Voters can hire express courier companies such as UPS, DHL, and FedEx to return voted ballots. Through October 31, FedEx is offering discounted shipping for last-minute voters in 94 countries through the Express Your Vote program https://OverseasVoteFoundation.org/overseas/ExpressYourVote.htm. Ballots sent to local election officials via express courier service do not receive standard postmarks, so voters using this method should confirm delivery on or before November 6 prior to payment and shipment. Ballots sent via mail at this late date are unlikely to reach local election officials by state ballot receipt deadlines. If you still wish to send your voted ballot via mail, place your voted ballot in a U.S. postage-paid envelope addressed to your local election officials. Drop it off at the Embassy, and we’ll send it back home for you without the need to pay international postage. If you can’t visit the Embassy in person, ask a friend or colleague drop it off for you. If it’s easier for you to use Costa Rica's postal system, be sure to affix sufficient international postage, and allow sufficient time for international mail delivery. You can get in-person assistance from our Embassy Voting Assistance Officers at the Embassy. Please contact Embassy San Jose’s Voting Assistance Officer at ACSSanJose@state.gov or 2-519-2000. Learn more at the Federal Voting Assistance Program's (FVAP) website at FVAP.gov. WHERE ELSE CAN YOU SEND YOUR BALLOTS THROUGH? (so anywhere along the way would be ok also [same price]). Do you have something small (and LEGAL) that needs to be delivered? He can take that also! (but they WILL want to see it to make sure it’s legit). Alonso’s been one of my main taxi drivers for over 6 years and he is a VERY conscious driver and I'd trust him to make any deliveries!!! He also speaks pretty good English! PLEASE "SHARE" this with anyone you know that can use this! The Consejo Nacional de Salaries has fixed the increase in the nation's minimum wages at 3.65% as of January 1, 2013. The decision closely parallels the proposal that was advanced Monday by employers and Tuesday by the central Government. The Ministerio de Trabajo y Seguridad Social estimated that the decision affects 1.2 million workers, about 85% of the labor force. Sandra Piszk, the minister, said on the agency's Web page that the Consejo uses a new methodology to arrive at the figure. A policy established in 1998 that recognized just the increase in the cost of living has been changed to a policy that seeks to redistribute the wealth of the country, she said. The increase is more than the 2.47% estimated inflation for the last 6 months of 2012. Ms. Piszk said that the increase is the largest in the last 2 years when pay hikes ranged from 2.63 to 3.17%. The minimum salaries are different for various occupations, and the ministry's Departimento de Salarios (2-256-2251) will post the new salaries on its website - www.mtss.go.cr/salarios-minimos.html (note you MUST add the www. first or it won't come up [I think many of the webmasters doing most of the governments websites were not taught properly in this instance of web design]) - before the first pay period in January. The new wages go into effect January 1, 2013. The tamal season is in the air, and Aserrí will start the holiday tradition this weekend with a fair devoted to the typical Central American dish. Costa Rican households around the country annually decorate their Christmas table with the maize-based course. It is presented wrapped in a plantain or banana leaf held together by a tied string. Inside is a gift of meat, garbanzo beans and rice. To eliminate the preliminaries, both the leaf and masa or dough can be bought pre-made in local markets. For those who would rather buy them completely prepared, or who just want to get the treat early, this Feria del Tamal gives the opportunity to buy tamales in the country's tamal capital. This is the eighth edition of the event which is formally called Expoferia Turística del Tamal Aserrí 2012. Activities will take place in the heart of Aserrí Centro around the community park. The canton is south of San José. Keeping up with the recent festival spirit, patrons can enjoy concerts and buy handicrafts, tamales, and other traditional foods. At night, fireworks will design the sky. Sunday the city will celebrate the 15th anniversary of Encuentro Nacional de Mascaradas. Representatives from Heredia, Asserí, Desamparados, and Alajuelita will dress in masks and parade from the south side of Cementerio de Aserrí. They will be accompanied by more than 20 cimarrona groups or small musical bands. Organizers explained that the purpose of the event is to highlight the natural, touristic and cultural beauty of the community. Tamal lovers generally eat them with chiles or a sauce. "This allows us, the Asociación Cívico Cultural Aqueserri, to continue to promote Aserrí as a tourist destination and as tamales-producing area," said Carlos Solís, a member of Aqueserri. To keep the event eco-friendly, the Comité Bandera Azul de Aserrí will collect recyclable waste such as plastic and tamal leaves. Later the organic trash will be composted and turned to fertilizer, Solís said. The fair begins Friday and ends Sunday - October 26-28, 2012. There will be two Sunday masquerades, one of the traditional diana or reveille accompanied by cimarronas at 4 a.m and another at 11 a.m. The Encuentro Nacional de Mascaradas is an effort to maintain the culture of the masks in the face of Halloween imports from the north. The mascaradas date to the Colonial era and probably before. The papier mâché giant heads are modeled after traditional characters and sometimes current politicians or public figures. What is "PLAN SMS INTERNACIONAL" on the ICE bill?? ??? Does this mean I made 20 (or ANY) SMS/Text calls internationally?? Does it mean I have a plan that allows me to make international calls? Because if it does, I JUST tried calling a U.S. # and it said I didn't have permission to make the call and in OVER 8 years of having this cell, I don't recall ever making an international call - besides, why would I do that if I had Skype for MUCH cheaper??? Someone said perhaps I had used my cell after crossing the border into Nicaragua or Panama which I hadn't within the timeframe above - but that was good to know that MAYBE there was a separate fee if I cross over say 5 minutes into another country and still have a bit of a signal (I'll be looking into that also). I can tell you that they're not showing up on my bills!!! WOW - I JUST looked at a bunch of old bills and it's on ALL of them!!! Everything will take place in Antigua Aduana in east San José and is FREE! Costa Rica's regulatory agency has approved an adjustment in the price of gasoline that will bring a gallon of super to $6.04. The increase is 30 colons a liter. McDonald's is celebrating the health of women today with a 5k FEMALE-ONLY run!! 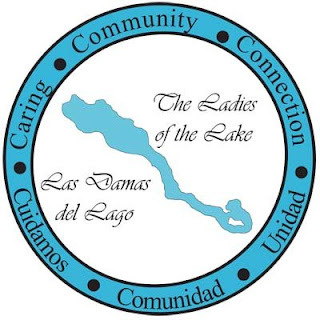 They've reached their goal of 2,000 women that have signed up for this event that is happening around the world and unfortunately they can not accept any more entries. But be forewarned of the TRAFFIC JAM this WILL create!!! WHERE: from McDonald's in Pavas to McDonald's in La Sabana. WHERE TO REGISTER: FULL - NO MORE ENTRIES! Does Costa Rica do DAYLIGHT SAVINGS TIME? Vote From Abroad Deadline NOW!!!! Where to find Beach Cruiser bikes in Costa Rica?